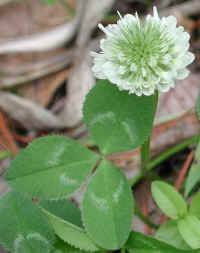 (White Clover (Trifolium repens) - 2) There are about seventy-five species of clover in the United States, approximately twenty of which grow in the East. 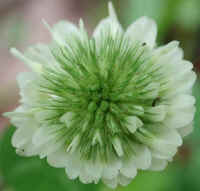 One of these is the white clover. In this near actual size photo, we can see three blooms in the process of opening. 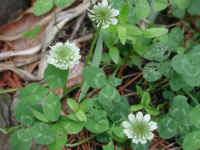 (White Clover (Trifolium repens) - 2a) This is an approximately five times actual size photo of the white clover. Note the distinctive three leaflet palmate cluster with its chevron pattern and finely saw-toothed edges. (White Clover (Trifolium repens) - 1) White clover is a member of the pea family, which add nitrogen back into the soil to aid in the growth of other plants. 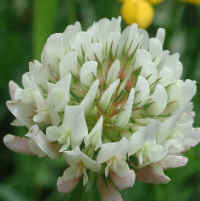 The bloom of the white clover is really a composite of many tiny tubular flowers clustered together into a rounded head. 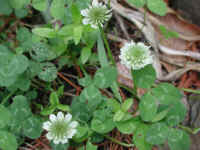 (White Clover (Trifolium repens) - 3) In this enlarged photo of the white clover we can see the central flowers as they begin to open. I can imagine that most of you who have been reading this series and looking at the photography know that I enjoy doing this. Similarly, as I uncover more and more detail with the camera, I also imagine the enjoyment God must have had in creating the many thousands of plants and animals with all their uniqueness, and the sadness He must feel over the destruction we have caused, particularly in our rain forests. 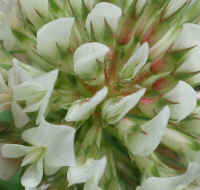 (White Clover (Trifolium repens) - 4) In this enlarged photo of the white clover we can get a bee's eye view of the perimeter flowers which grow to a maximum size of three-eighths of an inch long. 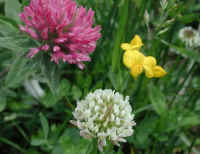 (White Clover (Trifolium repens) - 5) The pink tinged blooms of the white clover have been used to make a tea; the tender green leaves make a nice addition to a salad; and in times of famine, the dried flowers and seed pods have been ground into a flour to make bread. 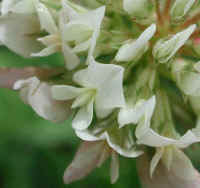 The flowers are also prized by bees for making their honey. (White Clover (Trifolium repens) - 6) White clover and its cousin red clover join together with a birdsfoot trefoil and some grasses to make one of nature's natural and living bouquets.